She was the star of every movie she ever made. With her soaring coloratura soprano voice and her natural girl-next-door beauty, Jane Powell was M-G-M's golden girl ingénue from the moment she appeared in Song of the Open Road in 1945. She grew up in the movies, starting as a cute, spunky teen and maturing into a lovely leading lady whose natural charm and spectacular voice ensured her popularity until film musicals faded from the screen. Jane Powell was the character's name in the first movie role played by sixteen-year-old Suzanne Lorraine Burce and the studio simply assigned it to her as her professional moniker. She was born in Portland, Oregon in 1929. That miraculous voice had already made her a local radio star and she was an immediate success from her very first screen appearance. Her persona was always that of a very likeable teen-ager next door who would burst into glorious song as often as a lightweight plot would permit. She was M-G-M's next-generation Jeanette MacDonald (who played Jane Powell's mother and became the teen's mentor). Fresh faced and brimming with enthusiasm, the youngster's star soared in films such as Holiday in Mexico, 1946, A Date with Judy, 1948 and Nancy Goes to Rio, 1950. At President Harry Truman's 1949 Inaugural Ball, Jane Powell was the star entertainer. She went on over the years to perform for four more Presidents and before the Queen of England. As she matured into a beautiful young woman, Jane Powell became one of the top leading ladies of movie musicals. She starred in two great classics in 1951. When Judy Garland became too ill to make Royal Wedding, Jane Powell stepped into the role of Fred Astaire's sister and smoothly stepped out onto the dance floor with graceful ease. In the film she sang the beautiful romantic ballad, "Too Late Now." Seven Brides for Seven Brothers cast the star opposite Howard Keel. She played his feisty wife with delightful comedic flair. There followed a string of bright, frothy musicals including Rich, Young and Pretty, 1951, Hit the Deck, 1955 and The Girl Most Likely, 1957. The star declares her own personal favorite to be Two Weeks with Love, made in 1950. Always a favorite of young movie goers, she was the subject of several paper doll and coloring books, much sought by collectors today. Jane Powell said, "I didn't quit the movies, they quit me." But when the studio stopped making musical movies, the screen star moved on to stage and television where her popularity never waned. She made her Broadway debut in Irene, replacing Debbie Reynolds who had made her own intital screen success years before playing Jane's younger sister. South Pacific, Carousel, The Sound of Music and many other classic musicals became showcases for Jane Powell's talents. She also guested on every major TV variety show in the '50s and '60s as well as Love Boat and Murder, She Wrote. She even starred in two television soap operas. In 1988, her autobiography, "The Girl Next Door and How She Grew," was published and became the basis for a one-woman show that toured the country. Today Jane Powell, the mother of three children, lives in Connecticut and is happily married to ex-child star Dickie Moore, her fifth husband. 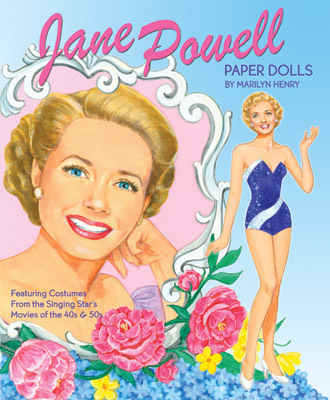 She was the guest of honor at the 2008 National Paper Doll Convention where she met the artist of this book, Marilyn Henry. The artist presented the delighted star with a paper doll she had drawn as a devoted fan decades ago when both were teen-agers. Jane Powell...golden girl with a voice to match!